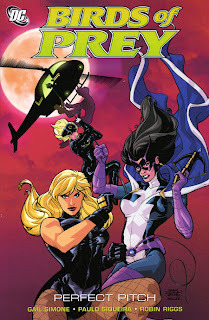 Gail Simone's previous Birds of Prey trade paperback, The Battle Within, offered a good pre-One Year Later cliffhanger regarding Barbara Gordon's paralysis. But Birds of Prey still had a couple pre-One Year Later issues to go, making Birds of Prey: Perfect Pitch something of a combination trade--two stories, one set just before the events of Infinite Crisis, and one picking up a year after the fact. As such, Perfect Pitch offers an interesting transition, serving as both a coda to Simone's work on Birds of Prey so far, and the beginning of something new. Over their long histories, the Birds of Prey characters have had something of a rough go, with Black Canary often serving as a hostage for Green Arrow to rescue, Oracle many times relegated to Batman's secretary, and Huntress kicked out of the Justice League. In the first Perfect Pitch storyline, as the Birds fight the Calculator and the Secret Society, Simone takes time to address the issues facing each of the Birds. Black Canary confronts Green Arrow about the ways he's mis-treated her, and ultimately forgives him, while Barbara Gordon reveals her Oracle identity to her father, in that way perhaps fully accepting her Oracle role herself. This leads to a confrontation where Oracle and Commissioner Gordon defend Oracle's actions to Batman, and Batman must later admit his own mistakes when he finally gives Huntress the approval she deserves. Indeed, the brusque pre-Infinite Crisis shadow of Batman falls in one way or another over all the Birds of Prey, and Perfect Pitch serves to bring this to a close; when Black Canary kisses Batman in the end, it is a symbol of the humanity often missing in the pre-Infinite Crisis Batman, now brought to the surface by the Birds. Simone features Black Canary in a solo story in the second half of Perfect Pitch, as Dinah trains under a woman proported to be Lady Shiva's mother. As Dinah single-handedly defends an entire village from an armed militia, Simone brings Black Canary nearly full circle from the start of her Birds of Prey run--from victim, captured by Savant and needing to be saved by Huntress, to martial arts expert and full-fledged super-hero in her own right. The rise of Black Canary here only underlines the injustice this character has faced for most of her incarnation--a mid-level fighter, ill-treated by Green Arrow, and ultimately aimless before being recruited by Oracle; it's no wonder that, until recently, Black Canary was often relegated to supporting character status. Here Simone, without necessarily detracting from Lady Shiva, turns Black Canary into a Shiva-level fighter, and she becomes that much more interesting for it. Why should Shiva, as a villain, be the greatest fighter in the DC Universe? Giving Canary that same potential is a change very long overdue. At the same time, Simone differentiates Dinah by showing that, even though Dinah now has Lady Shiva's potential for violence, she tempers it with humanity, partially in the form of adopting the child Sin. At face value, having Black Canary adopt a child would concern me; in the hands of a lesser writer, giving Black Canary a child would be a step toward "domesticating" Black Canary, having her retire from crime-fighting, at least until another writer wrote out or killed the child in some gratuitous way. But Oracle's protest that super-heroing "eats kids and family members" only serves as a reminder of the amount of death the DC Universe has faced lately; surely Simone introducing a child, one that reminds Black Canary of happiness, must be a good thing. I'm hopeful other writers will believe the same. On now to read Birds of Prey: Blood and Circuits, before we start a run-up to Justice League of America: The Tornado's Path. Stay with us! Apt examination of the good story ideas in this volume. Definitely a good thing when Simone returned to the series. That moment with Batman was funny and meaningful just for the reasons you described, too. I kind of hate to say it, but while I enjoyed the stories here, the fact that I knew some of what happened afterward concerning Black Canary soured me as I came to the end. I know it's a fannish thing to complain about, but it annoys me that this totally sensible character development of her leaving the team to raise her child and get away from the violence - which is absolutely a huge development, as she's a founding member and has always been on the book since it started - is totally negated, since she ends up not just joining, but chairing the new JLA! Not that it isn't a welcome "promotion" for the character, but I'm still tiffed they couldn't come up with a better solution for the transition. Nhex -- I'm in total agreement about your thoughts re: Black Canary. Especially given how Gail Simone built Canary up to be so strong over Gail's run on Birds of Prey -- not that there's anything wrong with Canary's decision to leave to raise a child (I feel like a Seinfeld episode), but it just rings so false since we know Canary isn't giving up crimefighting, and we know Canary's about to join the JLA. In a way the comics themselves denegrates Canary's decision (not Birds of Prey specifically, but the DCU in general), in that a hero retiring to raise a child can't ever last. We'll have a review of Birds of Prey: Blood and Circuits on Monday, with more about this when Canary finally makes her decision. Black Canary kissing Batman was hilarious! I think that was my favorite BoP moment ever - completely took me by surprise. I love moments like that with Batman - I was just reading Son of the Demon again last night. Batman was smiling, telling Talia how happy he was, etc. I love seeing him act like a human being! It was very sad to see Simone leave the series, though I even loved the older Chuck Dixon stuff. Amy -- I thought that was a great moment, too, and really showed how Black Canary (and Gail Simone) saw through Batman's pre-Infinite Crisis facade. It was also an interesting look at how the different characters see Batman in different ways -- Black Canary kisses Batman, while Huntress sees him as more of a father, and so on. I agree that this new, happier post-Infinite Crisis Batman, much like how he was in Son of the Demon, is a nice change. I'm a fan of your Geek Parenting blog; thanks for stopping by!